What do we know about the woman we say hello to at the bus stop, or the homeless man standing at the interstate entrance next to the shopping complex, or the widow across the street with a yappy little dog? We get hints and snippets here and there—we piece together a character as best we can, if we even care to. Sara Pritchard is the author of Crackpots and Lately. 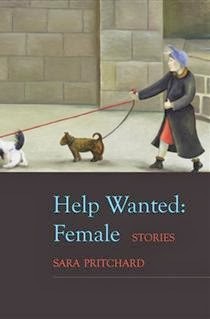 Readers who enjoyed Pritchard’s playful humor and unsentimental treatment of human imperfections will find Pritchard has further honed her story-telling craft in Help Wanted: Female. The new collection contains ten linked stories in which she treats her readers to more than a hint about what is behind ordinary faces in ordinary houses in ordinary lives. In Pritchard’s prose, we discover that those commonplace minds contain darkly comedic and wrenching confessions, authentic worries and sorrows. Nina, in “What’s Left of the Jamie Archer Band,” reflects in late middle-age: “What does it mean to be human. . . Is it being biped with opposable thumbs and a big brain. . . Is it something a saliva test can ascertain . . . what on earth are we doing here?” Often those revelations arise when absurdity crashes through the predictable structure of daily life. Often we are desperate for answers and are not even aware of it until we ask the questions that Pritchard’s characters ask. There are plenty of “good dog” mothers in Help Wanted: Female. The supporting characters of lovable pets throughout the collection, along with their eccentric celebrity names is one of the many treasures Pritchard leaves for readers to discover: Evangeline, the white terrier of a worried widower; W.B. Yeats, the nauseous elk hound of an impulsive office work, and Ponce de León who is devoted to a nostalgic Nina, even if she isn’t his first or last owner. “Forever Home,” the seventh story in the collection, finds Ponce de León on the verge of homelessness again. Pritchard ties together many characters and locations through Ponce de León’s presence. With the same affection for her human characters, Pritchard presents a “stinky” old dog’s philosophy when he sees another dog in the window of a house where he used to live: “This Ponce de León knew: 1)at any minute, your life could change, even your name; 2)at any minute you could end up back where you started; 3)at any minute you might have to leave home; 4)at any minute, someone you loved might leave you.” If your heart hasn’t melted by this point, if you aren’t weeping, you’ve got a hard heart, my friend. Purchase Help Wanted: Female HERE. Reviewer bio: Kim Loomis-Bennett is a life-long resident of Washington State, besides a detour into Oregon where she met her husband. Her poems and book reviews have appeared in The November 3rd Club, The Copperfield Review, Poet’s Quarterly, and Hippocampus Magazine. Her recent work is included in The Prose-Poem Project. One of her poems is also featured on the Washington State Poet Laureate's blog at http://kathleenflenniken.com/blog/. She teaches at Centralia College. She will graduate with her MFA, January 2014.